The Orthodox Churches are the second largest body of Christians, with an estimated membership between 250 million and 350 million people. The Orthodox Churches understand themselves to constitute the original Catholic Christian Church founded by Jesus Christ. The Orthodox faith is notable for its use of icons, candles, incense, relics of saints, and beautiful vestments during her rich liturgical services. It is often confused with the Byzantine-rite Catholics who are in communion with the Pope of Rome. The Orthodox are not in communion with the Roman Catholics, whom they view as holding several false doctrines. 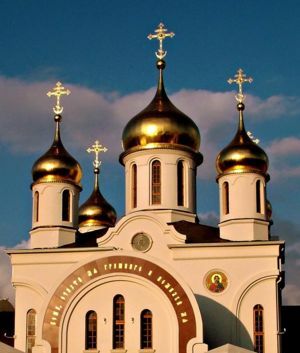 While in the West the Orthodox Churches may be thought of as the Church in Russia, Greece, and other Eastern European countries, they are present on all inhabited continents and in most countries of the world. While the Orthodox Church draws its beliefs from a very wide variety of sources, including the Gospels, the other books of the Old and New Testaments, the written histories, the writings and sayings of saints, the Seven Ecumenical Councils, angelic communication and other direct spiritual experiences, icons, the Holy Mysteries (sacraments) and many other things besides, the core of what they believe is contained in the Nicene-Constantinopolitan Creed and Tradition, (the deposit of faith). I believe in one God, the Father Almighty, Maker of heaven and earth, and of all things visible and invisible. And in one Lord Jesus Christ, the Son of God, the only-begotten, begotten of the Father before all ages. Light of Light; true God of true God; begotten, not made; of one essence with the Father, by whom all things were made; who for us men and for our salvation came down from heaven, and was incarnate of the Holy Spirit and the Virgin Mary, and became man. And He was crucified for us under Pontius Pilate, and suffered, and was buried. And the third day He rose again, according to the Scriptures; and ascended into heaven, and sits at the right hand of the Father; and He shall come again with glory to judge the living and the dead; whose Kingdom shall have no end. And in the Holy Spirit, the Lord, the Giver of Life, who proceeds from the Father; who with the Father and the Son together is worshipped and glorified; who spoke by the prophets. In one Holy, Catholic, and Apostolic Church. I acknowledge one baptism for the remission of sins. I look for the resurrection of the dead, and the life of the world to come. Amen. Greek Orthodox Church outside Mobile, Alabama. This creed is professed by all Orthodox Christians prior to baptism, and at every celebration of the Divine Liturgy (the main service of the Orthodox Church). The Bible The Orthodox regard the Bible as the main source of and rule against which the life, actions, words, and thoughts of the Church and her members are judged. Its role in the life of the church can not be overstated. It is read from at every service, in fact, most of the services of the Orthodox Church consist, at least in part, of chanting large portions of the Bible. The Gospels are accorded a special place in the worship of the orthodox Church. They are afforded great honor. For example, they are bound in Gold often beset with gems, separately from the rest of the Bible. They are carried in processions, they are kissed, they are bowed to, and they are censed. All stand when the Gospel is read during a service. When the Gospel is not being venerated or being read from it is kept on the Altar. All Orthodox Christians are expected to read from the Gospels and the Epistles every day, except during Lent when Old Testament readings are assigned. Verses that Eastern Orthodox Christians use to support theosis include John 17:22-23, 2 Peter 1:4, and 2 Corinthians 3:18. The biblical basis for theosis, according to Eastern Orthodox Christians, begins, however, with the creation account in Genesis, specifically 1:26. Theosis is implicit in the doctrine of the imago dei: humanity being made in the divine image. The divine likeness implies our calling to be in communion with God, rendering man unique to the rest of Creation. This moves beyond the legal model which focuses more on our external legal or judicial status and good moral behavior – rather than the transformation of our inner nature. As a result of Adam and Eve's sin the image of God has become marred in us. In the Incarnation, God came to restore the imago dei. Salvation as theosis is based on the restoration of the image of God in us which in turn calls for the restoration of communion with God resulting in a change in human nature, i.e., ontological consequences. This [Theosis] does not mean we become divine by nature. If we participated in God’s essence, the distinction between God and man would be abolished. What this does mean is that we participate in God’s energy, described by a number of terms in scripture, such as glory, life, love, virtue, and power. We are to become like God by his grace and truly His adopted children, but never becoming God by nature. The phrase “participate in the divine nature” (NIV) or “partakers of the divine nature” (KJV, OSB) is a translation of: “γένησθε θείας κοινωνοὶ φύσεως.” [Greek NT] The Greek for “participate” or “share” is κοινωνος (koinonos) which has a range of meanings. It has been used with reference to sharing in glory (1 Peter 5:1), sharing in Christ’s suffering (Philippians 3:10), and fellowship in the Holy Spirit (Philippians 2:1). It can have a spiritual/sacramental sense. Participation in a religious service, Christian or otherwise, has definite spiritual consequences. Participation in a pagan sacrifice results in participation with demonic forces (1 Corinthians 10:20) and likewise participation in the Eucharist results in participation in Christ’s body and blood (1 Corinthians 10:16). The emphasis here is on participation, transformation, and experiential change, rather than a judicial declaration of legal status. This distinction is central to the different attitude Orthodox and the Reformed have toward the fullness of salvation in Christ. Robert Arakaki also remarks that "The reference to the visible transformation of Moses’ appearance in 2 Corinthians 3:13 points to an ontological transformation, not just behavioral and attitudinal changes. Theosis also has eschatological implications," with Arakaki noting 1 John 3:2-3. This church which had always had a strong missionary zeal has suffered greatly under the heel of Islam. Also, the catastrophic effect of the Roman Catholic invasion of Constantinople during the 4th Crusade can not be overstated. That event saw most of the relics carted away or destroyed, and a Roman Catholic pretender put in the place of the Orthodox patriarch. Nevertheless, in the last hundred years this Church has recaptured its missionary heritage, establishing churches in Singapore, Malaysia, Australia, India, Korea, New Zealand, North America, Mexico, and South America. The Church of Constantinople also provides arch-pastoral services for some Orthodox in the U.S. who are not part of the Orthodox Church in America. This Church was established by St. Andrew but was a very small and almost insignificant Church until St. Constantine moved the capitol of the Roman Empire to this city and the Council of Nicea gave the Church there second place after Rome. Having been devastated first by schism, and then by Islam, and also by European colonial powers, this church languished as a diaspora church for Greek speakers for a thousand years. It is only now making remarkable strides to regain its lost footing, having expanded west into territory lost to the Roman schism, south into territory lost to the Coptic schism, and even beyond that all the way to South Africa, establishing new dioceses in Madagascar, Kenya, Congo, South Africa and many other countries and regions of Africa. Alexandria is one of the three ancient Petrine Sees, having been established by St. Mark on the instructions of St. Peter. Like the Church of Alexandria, this Church also was much hindered by schism and Islam. First they lost all of the Persian, all of the Indian, and most of the Assyrian dioceses to Nestorian heretics. Then Islam invaded. Nevertheless, this church never lost its missionary zeal. Even while persecuted they continued to send out missionaries, reestablishing the Church in all of the countries it lost. The Church of Antioch also provides arch-pastoral services for some Orthodox in the U.S. who are not part of the Orthodox Church in America. Antioch is one of the three ancient Petrine Sees. Though there were already Orthodox Christians in some of the Black Sea ports, and though Viking traders had become Christians in Constantinople and had built some churches along their Volga river trade-route, and though the Polish had begun some missionary activity along the western frontier of the Kievan state, the year conventionally recognized as the establishment of the Church of Russia is 988 when St. Prince Vladimir decreed Orthodox Christianity as the state religion. This church, like many of the Orthodox Churches suffered from Islamic invasion, but also Mongol conquest and most recently, severe persecution under the Communists. This last persecution produced more than 50 million holy martyrs. This is the only of the Local Orthodox Churches to have been established by a woman, St. Nina. In the 4th century she traveled around Georgia preaching and baptizing. Priests followed after her organizing parishes and administering the other Holy Mysteries. In the 18th century the Russian Emperor folded this Church into the Russian Church, but since the dissolution of the Soviet Empire the Georgian Church has reclaimed its autocephalous status. This church was devastated by communism, and later confused by the nationalist movement of Slobodan Milosevic. Though the bishops did not fall for his "Orthodoxy is Nationalism" heresy many of the poorly-prepared Orthodox laity did. The results were devastating. The spiritual heartland of this Church is Kosovo where Prince Lazar and the peoples of eastern Europe attempted to defend their homeland against the invading Ottoman Empire in 1389. He lost, and animosity accrued over the ages as the Serbs continued to keep their Orthodox heritage, but the Albanians adopted the religion of their conquerors. In more recent times Muslim Albanians waged a guerilla war against the Orthodox Serbs that led to the destruction of many centuries-old monasteries and churches. The Orthodox Church is very concerned with the heartland of the Church being ripped away from Serbia and has urged fighting to prevent this from occurring. Though this Church is second in size to the Church of Russia, it is probably 1st in zeal and active membership. The contributions of the Romanian Church can not be overstated. Martyrs, ascetics, monastics, theologians, hymnographers, missionaries, and spiritual warriors abound in this Church. Established by the brothers St. Cyril and St. Methodius in the 9th century this ancient Patriarchate was suppressed and was made a part of the Church of Constantinople by the Ottoman Turks in the 15th Century. Missionaries from Bulgaria were key in the evangelization of the lands of Serbia, Romania, and Montenegro. Only in the 1870s did the Church of Bulgaria regain its autocephalous status. Established by St. Lazarus (the one Jesus raised from the dead) this has been a church of martyrs, in the Second Century a hundred thousand Christians were murdered here by Jewish mobs, and in the 1840s the entire Episcopacy and all leading laymen were rounded up and murdered by the Turks. It has been autocephalous since the Council of Ephesus made it so A.D. 431. Nevertheless, it is an important pilgrimage site since the relics of St. Lazarus and St. Barnabus are there. Two stories about St. Lazarus still circulate on the island. One that he laughed aloud at a man who stole a clay pot saying "clay stealing clay" and that he always served something sweet at every meal. Though part of the Church of Constantinople for most of its history, this Church emerged from the 19th and 20th century struggle for Greek independence from the Turks. Probably, the most famous bishop of Athens is St. Dionysius who was converted by St. Paul. This Church is the only Church in Europe that has to deal with a Muslim-majority population. Oddly, the Greek Primate of this church, Archbishop Anastasios is one of the most loved people in Albania. Even Muslims come to him for blessings on their marriages and for prayers when they are sick. This Church has existed since the 9th Century when it was established by Saint Cyril and Saint Methodius but was part of the Church of Constantinople for most of its history. In the 15th century most of the Orthodox in Poland fell away into Roman heresy and formed one of the Eastern-Rite Catholic Churches in communion with the Pope of Rome. In 1924 this much diminished Church was granted autocephaly. After WWII part of western Byelorussia was added to Poland. With the territory came many Orthodox Christians. Most Orthodox in Poland are descendants of these former Byelorussians. The brothers St. Cyril and St. Methodius established this Church in the Czech region of Moravia in the 9th century. But when the brothers died Pope Stephen V of Rome ordered that their mission be destroyed, and forced all of the people who converted under the Sainted brothers to leave Moravia and settle in what is now Slovakia. There, due to the influence of the nearby Orthodox Poles and the Kievan State the Orthodox were able to survive, barely. In 1921 many people began leaving the Roman Catholic Church and converting to Orthodoxy under a Serbian Bishop. One of them was a Roman Catholic priest who took the name Gorazd upon his conversion. A few years after his conversion he was consecrated Bishop of Moravia. Under his apostolic ministry the Church of Bohemia and Moravia, as well as Slovakia experienced tremendous growth. He was martyred by the Nazis in 1942. The Church suffered greatly under the Nazis and the Communists and is only now regaining its footing. It was officially recognized as Autocephalous by the other Autocephalous churches in 1998. In 1794 several monks from Russia's northeastern monasteries began working with the native population of Kodiak and Unalaska Islands. Among those monks was St. Herman. St. Herman was born in the town of Serpukhov in the Moscow Diocese around 1756. At the age of 16, he entered the monastic life at the Trinity-St. Sergius Hermitage near St. Petersburg. While here he developed a severe throat infection from which he nearly died. After fervent prayer before an icon of the Theotokos, he fell into a deep sleep. During this sleep, He dreamed that he was healed by the Virgin and upon waking, he had completely recovered. A few years later he moved to the Valaam Monastery on Lake Ladoga. At this time the Golikov-Shelikov Company - licensed to exploit the resources of Alaska - requested monks to work in a new Alaskan mission. Father Herman was among the eight monks selected. They arrived on Kodiak Island on September 24, 1794, and immediately set out on the task of educating and converting the natives. Eventually only Fr. Herman survived from this original mission. Orthodox Church at one of the entrances to Red Square. The members of the mission felt that it was their duty to protect the Alaskans from harm and exploitation. They defended them against the often cruel treatment of the Russian-American Company which controlled the colony under the leadership of the cruel Alexander Baranov. As a result of their protests, and because they tried to place the natives under imperial protection by administering an oath of allegiance to the Czar to them, Baranov threatened the monks with physical violence and even placed them under house arrest. Sometime between 1808 and 1818, Fr. Herman went to Spruce Island. He spent the rest of his life on the island, where he cared for orphans, established and ran a school, and continued his missionary work. He lived the ascetic life which has been standard since the time of the Desert Fathers. He built a small chapel and guest house. Food for himself and the orphans was produced from his own experimental garden. He wore the simplest clothing and his cell was practically empty. His life was devoted to prayer and to following the services he could do as a layman who had not been ordained. His love grew to the point that he could see into the hearts of his spiritual children and help them. The natives regarded him as their intercessor before God. When there was a tidal wave (tsunami) on the Island, Fr. Herman took an Icon of the Theotokos, placed it on the beach and assured the people that the water would not rise beyond the place where the Icon was, and it did not. When there was a great fire on the island, he dug a trench and stayed the flames. Prior to his death he foretold that there would be no priest to bury him and that he would be forgotten for 30 years. He died on December 12, 1837, and was forgotten until 1867 when Bishop Peter of Alaska heard about him and had his life investigated. This investigation was followed by publications of his life in 1894, 1900, and 1952. In 1952 an Akathist Hymn was composed, and on March 11, 1969, the Great Council of Bishops solemnly proclaimed the Act of the Universal Church Canonization of the Staretz Herman to Sainthood in the Orthodox Church in America: "Taking into consideration the long and undisputed witness of the grace of God, appearing through the servant of God, the Staretz Herman of Alaska." The Canonization was performed on August 7–9, 1970. In 1822 the Holy Synod of Russia decided it was time to send a priest to perfect the work of the monks. A priest named Ionn volunteered to be that priest. In 1823 the 26 year old Fr. Ionn and his family set off for Unalaska Island. He built a church with his own hands, learned the language of the local people, the Aleuts, composed an alphabet for their previously un-written language, and translated the Gospel of Matthew into Aleutian. He also translated a catechism and some liturgical books for the Aleuts, and wrote the first book ever written in the Aleutian language, a brief course in dogmatics entitled, “A Guideline to the Kingdom of God". Considered one of the best catechetical courses and educational aids for children and youth, this course has been reprinted in several languages many times since. Fr. Ionn established a school with an enrollment of 600 children, built a hospital, and fought hard against the practice of polygamy that treated women as property. After ten years on the island, Father Ioann had baptized all of the people in the archipelago. He made a trip in 1829 to Nushegak on the American continent and preached the Word of God to people who lived on the Bering Sea coast and baptized those who came to believe. In 1839 Fr. Ionn returned to Russia to convince the Holy Synod of the need for establishing a permanent mission in North America. While he was on this trip back home he received the news of the death of his wife. After a pilgrimage to St. Sergius Monastery of the Holy Trinity and to the shrines in Kiev, Archpriest Ioann, on the advice of Metropolitan Philaret of Moscow, took monastic vows on November 29. He took the name of Innocent, after Bishop Innocent of Irkutsk, and was elevated to the rank of archimandrite on the following day. In 1840 the Holy Synod in Moscow created a new diocese in North America and consecrated the Archimandrite Innocent as its new Bishop. In 1855 St. Innocent was elevated to Metropolitan of Moscow. While serving in that capacity he established the Orthodox Missionary Society to help fund mission work. He was concerned for arranging the work of theological schools in his diocese, opened a school for icon-painting and other arts for poor children and orphans, transformed Philaret's college into a school for daughters of the clergy who did not receive any pensions or allowances, founded the large Ostrovsky alms-house, and wrote educational aids for the clergy of the staff list, as well as their widows and orphans. At the same time, the great enlightener continued his concern for the Russian Orthodox Church in North America. It was on his initiative that the Holy Governing Synod chose San Francisco as the bishop's See. Metropolitan Innocent also emphasized the need for the clergy to know English and for the Church to train priests from among local Americans as a necessary condition for strengthening Orthodoxy in the American continent. Feeling his death approaching, Metropolitan Innocent of Moscow and Kolomna asked on the Great Tuesday, 27 March 1879, that the Sacrament of Holy Unction be administered to him. On the Great Thursday, 29 March, he Communed. On Great and Holy Saturday, March 31, the Metropolitan, Equal to the Apostles, fell asleep in the Lord. The Orthodox Church's next great burst of growth in America occurred during the ministry of St. Tikhon of Moscow, the Enlightener of North America. St. Tikhon was a missionary bishop to North America. During his short ministry in North America he became a U.S. Citizen, and the Church grew from 15 parishes to 70 parishes. He was called back to Moscow in 1907. He was elected Metropolitan on August 15, 1917. On November 5 of the same year he was selected, by drawing lots, to be the Patriarch of Moscow and all the Rus’. The Communists accused him of sabotage and imprisoned him from April 1922 through June 1923. He fell ill and was hospitalized in 1924, and fell asleep in the Lord on March 25, 1925, just two days after serving his last Divine Liturgy. One of St. Tikhon's most important decisions during his time in North America had to do with how to minister to Orthodox Christians from the Middle East who were arriving on the East Coast. He realized that these newest members of his flock needed someone who could speak their language and who was familiar with their distinct customs so he asked the Patriarch of Antioch to send him an Arabic-speaking priest. The priest who arrived was Fr. Raphael Hawaweeny. In 1904 he was consecrated a Bishop by St. Tikhon and St. Innocent and from then until his death in 1915 he was known as Bishop Raphael of Brooklyn. During the course of his ministry he established 29 parishes and assisted in the establishing of a monastery in Pennsylvania. He was recognized, even while living, as a saint but was not officially glorified by the Church until March 2000. With the rise of atheistic Communism in Russia and the corresponding infiltration of the KGB into the Orthodox Church in Russia, many Orthodox Christians in North America began clamoring for bishops they could trust. Additionally, the Russian Church split into two factions: The Metropolia (today known as the Orthodox Church in America or OCA) and the Patriarchal parishes. Essentially, the Patriarchate of Moscow sued the church in America for control of properties and actually won some of the cases. The parishes in those cases went under the direct jurisdiction of the Patriarch of Moscow. A third group of Russian bishops arrived in the United States following the Russian Revolution. They called themselves the Russian Orthodox Church Outside Russia. For a while they merged with the Metropolia but they did not think of themselves as Americans or as missionaries to America. They were intent on keeping Russian culture alive among the exiles and returning to Russia someday. They eventually split off from the Metropolia. Amidst this confusion, there was a desire for bishops from the “old country”; that is, Serbs wanted a Serb bishop, Albanians wanted an Albanian bishop, etc. And the Archbishops and Patriarchs from the “old countries” were happy to send them. Thus, right after the Russian Revolution, what had been an administratively unified Church in the U.S. became administratively fragmented. Around 1998, former KGB agent Konstantin Preobrazhensky investigated some recent deaths among the Russian Orthodox Church Abroad, including Archpriest Lev Lebedev of Kursk in April 1998, and suspected that then-FSB head Vladimir Putin had been involved in the assassination. In addition, Estonian archives pinned Patriarch Kirill as an unreprentant KGB agent, and that his installment had him bringing Putin out during consecrations, similar to Stalin during World War II. Holy Trinity Greek Orthodox Church in Bluff City, Tennessee. After decades of a very cold relationship, in 1970 the Metropolia was granted autocephaly (think of it as administrative independence) by the Patriarch of Moscow and became known as the Orthodox Church in America (OCA). When that happened, numbers of the Romanian, Bulgarian, and Albanian Churches in the USA and Canada merged with the OCA. The Orthodox Church continues to grow in North America. Most of its bishops were born in America, many having converted (either from religions outside Christianity or other Christian churches) as adults. The Orthodox church has experienced a couple of waves of mass conversions, such as when several thousand Byzantine-rite Catholics converted in the early 20th Century. The Orthodox in America have established one undergraduate college, Holy Cross in Boston as well as several seminaries including (Anchorage, New York, Boston, and Pennsylvania), one practical ministerial institute (Penn. ), and a graduate school for lay theologians (Berkeley). Some of their parishes have Saturday schools where Greek, Russian, and other languages as well as theology and culture are taught to children. A few parishes have established High Schools and elementary schools. Several monasteries have been established for men and women, and two (one in New York and one in Miami) have converted from other churches and have become Orthodox monasteries. ↑ See also 100 Bible Verses about Traditions (openbible.info). ↑ Serb church urges state of war over Kosovo, Reuters, Feb 17, 2008. This page was last modified on 10 March 2019, at 10:38. This page has been accessed 70,909 times.